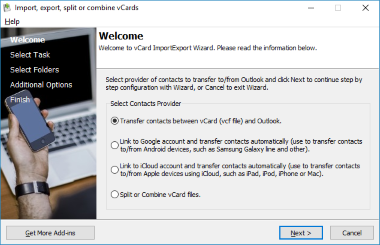 Use vCard ImportExport to import multiple vCard files (.vcf) to Outlook contacts, or export multiple Outlook contacts to vCard files at once. Split, combine vCard files even without Outlook installed. Use vCard ImportExport to import multiple vCard files (.vcf) to Outlook contacts, or export multiple Outlook contacts to vCard files at once. Split, combine vCard files even without Outlook installed. Sync, export or move Outlook contacts in an easy way. Use this tool to manage duplicates while importing. You can also apply date range filter while exporting. Use command line interface to automate import, export task.